A small evergreen shrub that grows in the moist, open woodland of S.E. Asia, the Serissa foetida, or Snow Rose, derives its name from the putrid smell of its bark and roots when they are crushed or cut; Foetida is literally 'foul-smelling' in Latin. A Snow Rose is one of the most popular of all bonsai subjects, but it can be difficult to maintain, however, it is a worthwhile challenge for experienced hobbyists and beginners alike. As this tree does need attention, it is best for the regular traveler to insure that it will be cared for properly while they are away by another individual because it has a tendency to drop its leaves at the first sign of any type of stress. Being a subtropical species A Snow Rose should not be near or on top of a vent or be subjected to drafts or cooler temperatures. Indoor cultivation is required in most areas most of the year. It is important to note that it is difficult to keep up the humidity levels required by this delicate plant in an indoor environment and this often causes the tree to suffer. Never place the tree on a windowsill above a radiator, (radiators/central heating are the primary reason for failure with the Snow Rose as they dry the air considerably) do not place the tree on a windowsill where the curtains are closed at night as this environment will be too cold for this plant…it is important to always avoid cold drafts indoors. Place it outside in a sunny spot with afternoon shade in spring when nightly temps are above 50 degrees and all possible danger of frost has passed. Leave out until fall, as long as nightly temps are above 39 degrees. Be sure to put it in a bright, cool spot until spring, or you can place it in a bright, warm (65-90 degree) location and it will continue growing. The Snow Rose strongly dislikes wet roots though bone dry compost will also kill them. Water thoroughly and do not water again until the compost has NEARLY dried out. Daily watering as a routine should not be carried out unless necessary, so you must check its soil daily. Ensure the gravel tray is kept continually wet but never allow the pot to stand in water. Yellow leaves can often indicate overwatering (though this can also be due to other factors), brown and crispy leaves indicate lack of water or lack of humidity. A Snow Rose will present several noticeable signs if it is distressed. The two most obvious and easily remedied are the result of under watering and over watering. Under watering is characterized by yellowing leaves that are also drying, crispy, and slightly brown. If it has been under watered, do not attempt to over compensate by repeatedly saturating the soil. Instead water the plant and increase the frequency of your soil moisture inspection. The soil mix should be a mix that allows for the drainage of excess water. Note that the Bonsai should never sit submerged in water and that excess should be allowed to flow out the bottom of the pot. Over watering is indicated when perfectly green leaves start to yellow; to remedy this ensure drainage is not compromised and increase your diligence in checking soil moisture levels. Feed once a month during the winter (September to March) and every two weeks between March and September when growth is stronger. Only feed when the compost is already moist or the roots will burn. Do not feed when the tree has lost leaves or if it is not showing new growth. An untended Snow Rose will lose its shape, complicate further growth, and generally make the plant worse off in the long term. Leaves should be ‘finger pruned’ by pinching them between your thumb and forefinger and pulling with mild pressure. Take note of sprouts growing off the base of the tree or near the trunk along a main branch. These sprouts will stunt the growth of the tree ‘sucking’ life out of the bonsai and should only be left if required for multiple trunk styles. These sprouts can be trimmed off easily using pruning shears or sharp scissors. When pruning always cut at either the next bud, or flush with the main branch/trunk of the tree. Black branches should be pruned immediately because they are rotting. The clip-and-grow method is very successful with this species. Wiring can be done at any time to smaller branches but use care because larger branches are stiff and brittle and the bark is easily marked. The snow rose can be trained in all shapes except the formal upright. Scale insects and root rot are the primary issues with the Snow Rose. Some scales can be blasted off with water (all are susceptible to this in the crawler stage). Early infestations of the larger scales can be controlled by simply removing the individual scales by hand. Horticultural oil, insecticidal soaps, and Neem oil are effective if applied directly to the insect bodies. Scales are easiest to control in the crawler stage so be sure to be attentive to their development. Softwood cuttings should be harvested in spring or early summer. Encourage growth with rooting hormone and bottom heat. Snow Roses dislike having their roots prunes and will prefer being left alone for 2-3 years at a time. Repot in spring when you first notice new growth as this helps the root system recover quickly. Use a standard soil mix. Do not water by schedule! A watering schedule is unacceptable for a Snow Rose. While it may survive under these conditions, in order to ensure the longevity and health of your plant it is crucial that you check the moisture levels in the soil by touch. 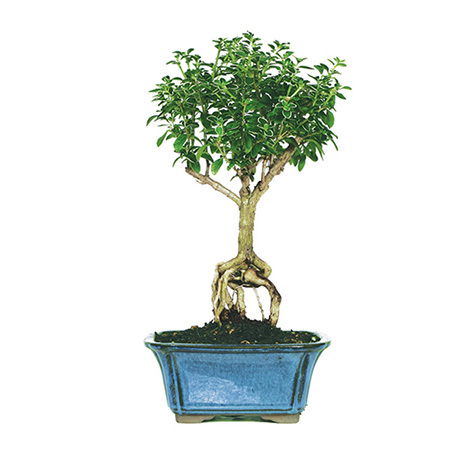 Unlike some other household plants, bonsai can vary quite drastically in their water consumption and as such they should be treated as though they are a person you are in charge of feeding; ask if their hungry, then feed accordingly. Forcing water upon a already sodden soil can lead to many complications, including root rot. Moving the tree to a new position will stress the tree until it acclimatizes, on occasions causing yellowing and dropping leaves- this should be followed within a few days by fresh growth.